The ZTE Nubia X6 officially launched at an event in Beijing and it proved to be a more exiting device that the latest rumors described. It's a 6.44" phablet with a Snapdragon 801 chipset and dual-SIM support plus LTE connectivity. 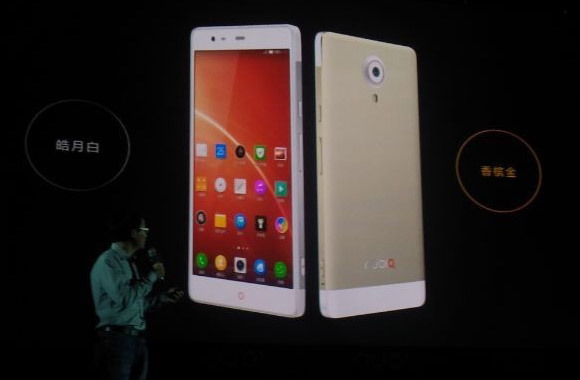 The Nubia X6 phablet has a 7.9mm thin metal body with relatively narrow bezels. The 6.44" LCD screen has 1080p resolution (no QHD despite rumors) with 344ppi pixel density. The phablet will initially be powered by a Snapdragon 801 MSM8974AB chipset (4x Krait 400 at 2.3GHz), but there will be a second version with 8974AC (same CPU at 2.5GHz). The chipset is paired with 3GB RAM but it's unclear what Android version the device will be running. The camera features an optically stabilized 13MP sensor and 5-element lens with bright f/2.0 aperture. By the sound of it, the front-facing camera will also have a 13MP sensor (this one BSI) with a 5-element lens and f/2.2 aperture (but no OIS). On the connectivity side, the ZTE Nubia X6 has two SIM cards, 3G and LTE, including China-specific varieties, dual-band Wi-Fi, Bluetooth 4.0, NFC and USB 3.0 with OTG. The phablet has three mics for noise cancellation. Two last specs to consider – a 4,250mAh battery and built-in storage. The base X6 will have 32GB storage and will cost CNY 3,000 ($485), but there's a 64GB option at CNY 3,500 ($565) and a whopping 128GB option at CNY 4,000 ($645). There doesn't seem to a microSD card for memory expansion. All that's left to find out now is a launch date and if (fingers crossed) it will be available outside of China. It will offer the Sony Xperia Z Ultra stiff competition. Thanks to Andi for the tip! I was searching for Dual sim with larger screen and atleast 2GB RAM with HDMI port and higer resolution with 4G. I feel ZTE Nubia X6 is the perfect match to my requirement. When will it arrive in India. Hope it will be available outside China. I'll get one.